I can ORDER NOW and SAVE $40! Yes, I want to put an end to the guilt and stress from the ultimate time and success thief—procrastination. I'm ready to become an ultra-confident peak performer. 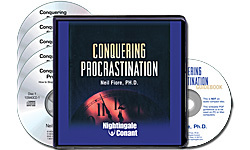 Please send me Dr. Neil Fiore's 6-CD audio program Conquering Procrastination: How to Stop Stalling and Start Achieving, PLUS Workbook on CD for $39.95 which is $40 OFF the regular retail price. If this program does not put an end to my procrastination for good, I can return this program within 30 days. No questions asked.